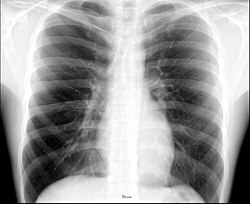 X-ray image o the chest shawin the internal anatomy o the rib cage, buffs an hert as well as the inferior thoracic border–made up o the diaphragm. 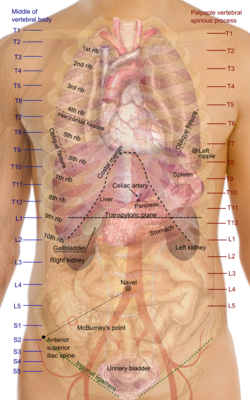 Surface projections o the organs o the trunk, wi the thorax or chest region seen stretchin doun tae approximately the end o the oblique buff fissure anteriorly, but mair deeply it its lawer leemit rather corresponds tae the upper border o the liver. The thorax or chest (Greek: θώραξ, Laitin: thorax) is a pairt o the anatomy o humans an various other ainimals locatit atween the neck an the abdomen. This page wis last eeditit on 4 Juin 2015, at 15:04.